Those people who know me know that I am really not a competitive person… I don’t care if I’m on the winning team, or the losing team, but when it comes to being the craftiest… You better watch out, cause I got a huge crafty ego! 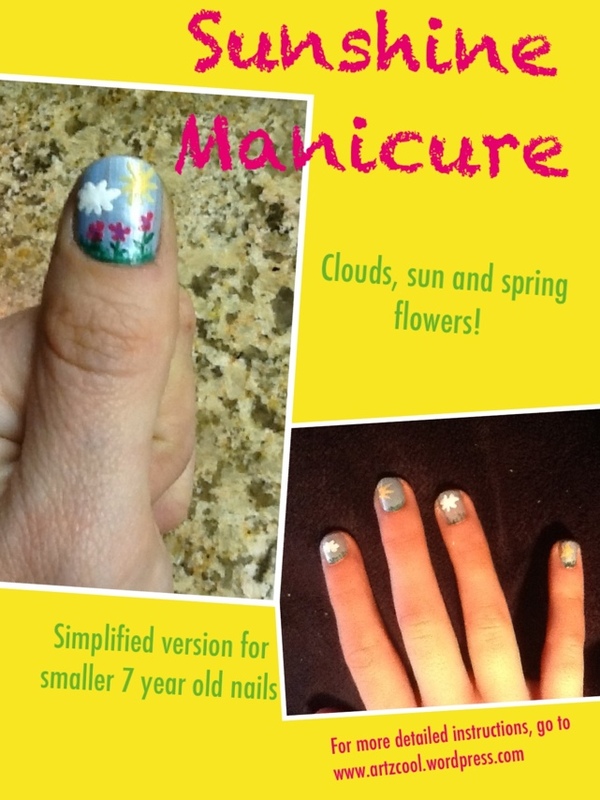 So, I have been spending far too much time on Pinterest lately, checking out my competition…and I have been noticing that there are some really amazing looking manicures, like my personal favourite, tye-dye nails! So anyways, I was driving home tonight thinking about how horrible my nails looked because i have been painting a mural at school, which got me thinking about manicures, and what kind of manicure could I do that i haven’t seen before. (There’s my nasty crafty competitiveness showing through!) 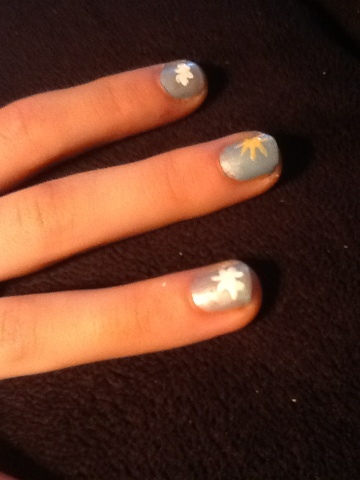 So i thought to myself, wouldn’t it be cool if I could paint a sunshine manicure? Then, I used the white brush to paint a few dots close together to look like clouds. 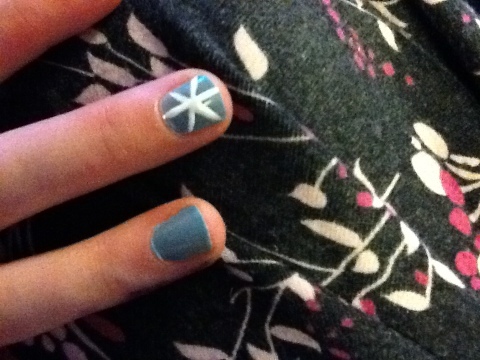 I did this on every other finger for Sam. 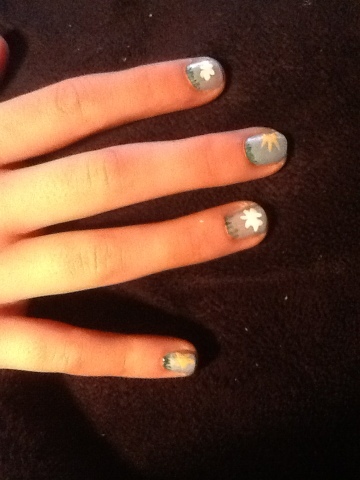 Then, I used the yellow to drop a blob of nail polish and used the brush to spread out the yellow to look like sun rays. 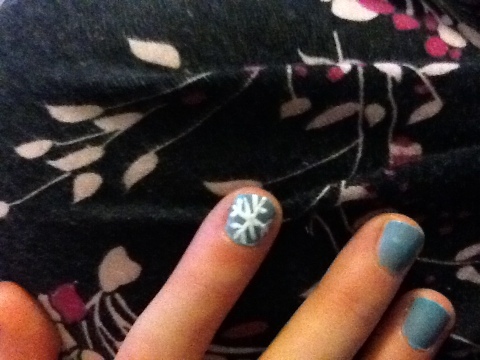 Considering the size of Sam’s 7 year old nails, this was tricky! 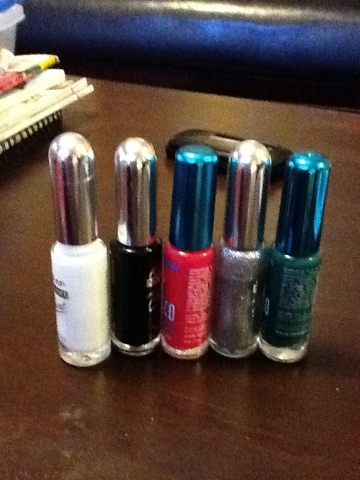 So, you might think that I stopped there, but oh no, I decided to kick it up a notch…by adding nail polish grass. That’s right, nail polish grass. 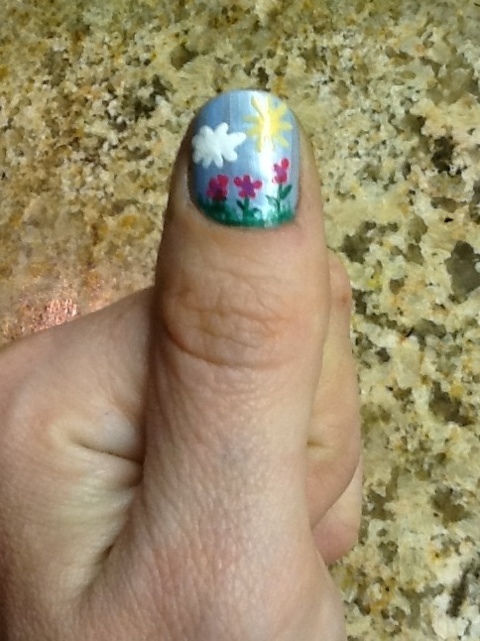 Now, unfortunately Sam was refusing to sit perfectly still by this point, and it was her bedtime, so I had to continue on my own hand, which was actually a lot easier, because my nails are a much bigger canvas…there was enough room for a sun, cloud, grass, and I even had room to add three flowers! Now, if only I didn’t have to mess up my amazing manicure by painting my mural again tomorrow. As a parent, I often think that my kids have no clue what life is like for other children…. And in some ways, I find that comforting. In other ways, it’s also disturbing, but in this case, I’m going to go with comforting. 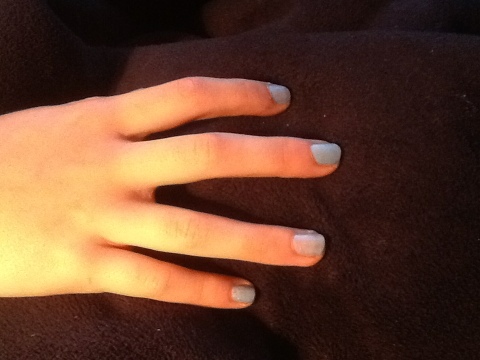 Begin by painting the nails with two coats of you base colour. We picked a light blue. For the next step, the trick is to use a nail polish with a really thin brush. You can buy them at shoppers, or the dollar store. 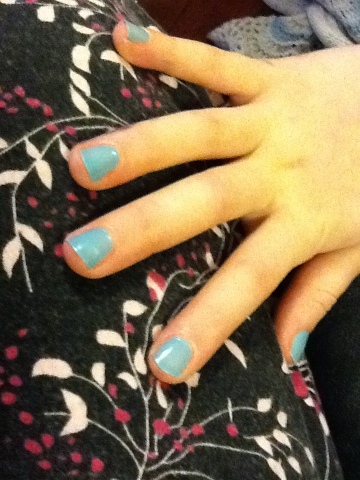 We finished the manicure by giving it a few minutes to dry, then adding a clear top coat to seal in the design. I ended up using the exact same design when I made cookies a couple days later. 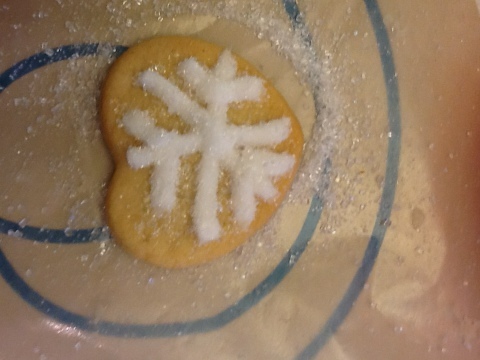 I used white icing, then sprinkled on a coarse sugar on top.